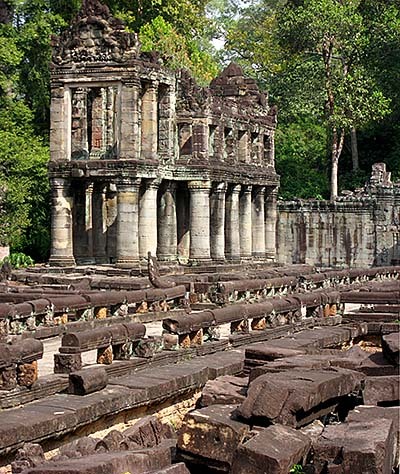 One of the bigger sites in Angkor Archaeological Park is the former temple-city of Preah Khan. 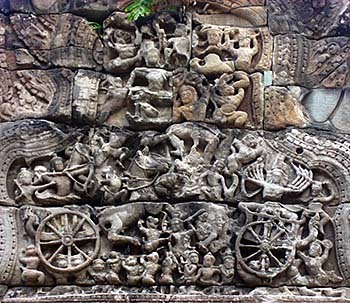 It is supposed by historians that this could have been a temporary capital of Angkor, before the completion of Angkor Thom, the last capital of the medieval Khmer empire. It seems that at the place a decisive battle had took place, in which the then Cham king had been killed. 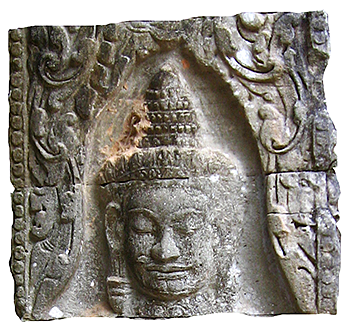 The Cham People from what is nowadays south Vietnam had captured Angkor in former years and kept it occupied until 1181, when they were defeated by a Khmer army under the command of later king Jayavarman VII. At the place of his victory, Jayavarman VII ordered the construction of a huge, central temple with satellite buildings and a whole town with alltogether around 100,000 people living in. As founding date is the year 1191 CE given, and it's very interesting to see how quick such large places could be constructed in the middle-ages, without all the modern machinery we are nowadays used to. 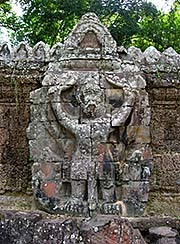 The assumption that Preah Khan was a provisoric capital is based on Maurice Glaize's observation that the four bridges over the moat towards the gopuras are built in the same way as in Angkor Thom, the later capital, and unlike that of Ta Prohm or Banteay Kdei. While nearby Ta Prohm was dedicated to the king's mother, Preah Khan, what means so much as holy sword, was dedicated to the king's father. It was meant to be a Mahayana Buddhist temple, although it later was changed to Hinduism under the king's successor Jayavarman VIII. The Buddhist statues and frescos where demolished or altered into something where Hindus worship to. 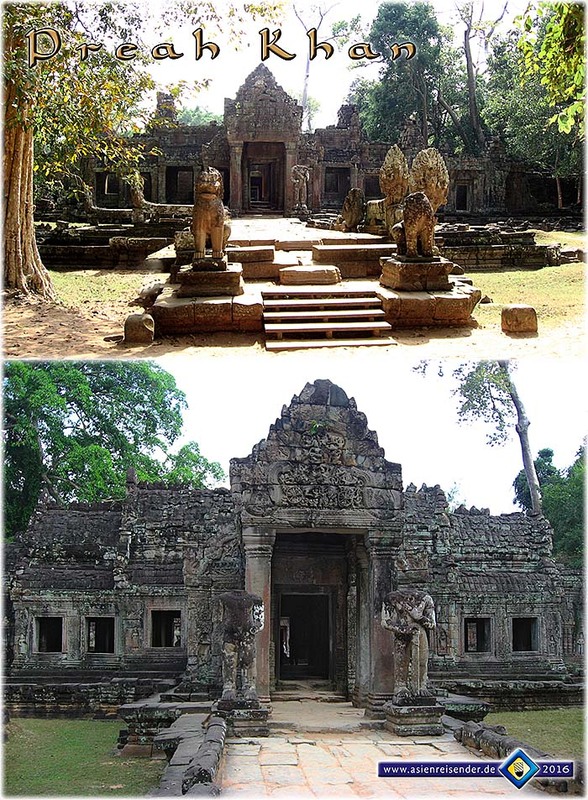 Like usually for Khmer temples, Preah Khan was aligned to an east-west-axis on which a royal highway was built. The whole compound was surrounded by an outer wall of 750m times 900m. The wall had four gopuras (gates) and a water trench outside. Neighboring to the compound lies the north barray, a huge artificial water pond. The inner, main temple compound is surrounded by another wall. 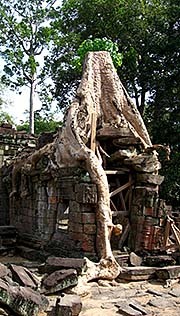 Like Ta Prohm, the temple buildings are a complex ensemble who have been restored but partially and intentionally left in a state of decay. Huge figtrees have grown on top of the buildings, spreading their large roots over the roofs and into the windows. Many galleries are filled with the debris of their collapsed roofs. This article is based on a visit and personal observations. Moreover it's based on a number of publications. You find a list of them on the Literature page. 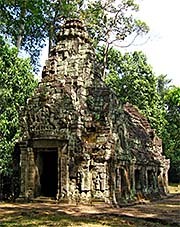 Most notably here is Maurice Glazier's classic 'The Monuments of the Angkor Group'. However, it's not at all exhausting; it comes together with articles from newspapers, magazines, (qualified) websites and movies, both fiction and documentary. Sometimes, a good talk with a connoisseur of a certain topic provides me with facts, ideas, inspirations and innovations and/or reveals a mistake.